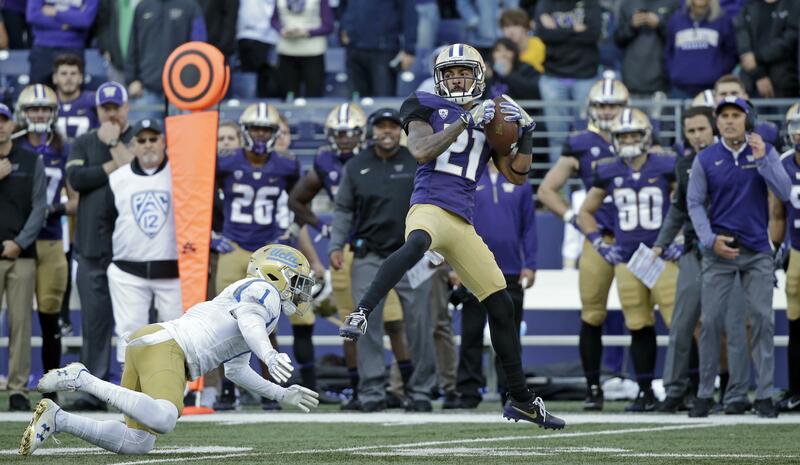 SEATTLE – Chico McClatcher isn’t the only Washington wide receiver making a comeback from major injury. For the second time in his Husky career, Quinten Pounds went down last fall with a season-ending knee injury. He appeared in three games as a true freshman in 2015 before suffering a torn ACL in his right knee. He then tore the ACL in his left knee during a practice leading up to the Oregon game in November 2017. Like McClatcher, Pounds was back on the field last week for the start of fall-camp practices, and the fourth-year junior from Cypress, California, has been one of the team’s most consistent receivers in practice. The 6-foot, 180-pound Pounds has 16 catches for 241 yards and two TDs in his UW career. His most memorable play was a 43-yard TD grab at Colorado last season in which he out-jumped two defenders in the end zone. On Tuesday afternoon, he made a similar leaping catch over cornerback Byron Murphy for a big gain. “People have told me, ‘You tear both of your ACLs and you’re not going to be the same person.’ But I’ve never listened to what someone else has to say about me. I always just do the best I can and not worry about other people,” Pounds said. Pounds said going through recovery and rehab with McClatcher – who tore the ACL and suffered a broken ankle in his left leg last fall – helped both receivers. The team’s plan with both receivers is to ease them back into the mix gradually this month. This is where Nick Harris wanted to be all along, in the middle of the action for the UW offensive line. In the spring, Harris transitioned from left guard to center to replace the graduated Coleman Shelton, the All-Pac-12 first-team center in 2017. Behind Harris, the Huskies have turned to redshirt freshman Cole Norgaard as the No. 2 center. Senior Jesse Sosebee spent most of the spring as the backup center, but he’s been moved back to guard.